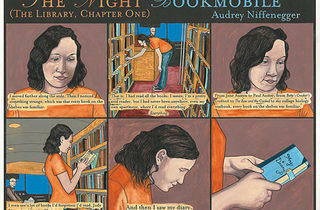 Audrey Niffenegger parks The Night Bookmobile at Printworks Gallery. Late one night, on the corner of Belle Plaine and Ravenswood Avenues, Alexandra encounters a Winnebago that contains every book she’s ever read—including her diary. 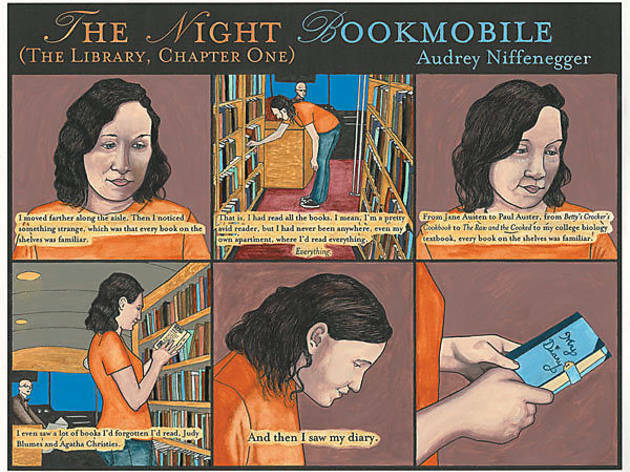 So begins Audrey Niffenegger’s spellbinding serial comic The Night Bookmobile, which appeared weekly in Britain’s The Guardian from May to December 2008. Alexandra befriends the bookmobile’s librarian, Mr. Openshaw, but as she becomes obsessed with finding the Winnebago again—and again—her story takes a dark turn. On Friday 17, Niffenegger presents her original illustrations for The Night Bookmobile at River North’s Printworks Gallery (311 W Superior St, suite 105). (They’re not for sale, but giclée reproductions will be.) The 46-year-old artist and author cofounded the Center for Book and Paper Arts at Columbia College and teaches in the school’s interdisciplinary book-arts M.F.A. program. Her 2003 novel, The Time Traveler’s Wife, is about to be released as a film; her second novel, Her Fearful Symmetry, comes out this October; and The Night Bookmobile will be published as a graphic novel next year. We recently spoke with her by phone. Time Out Chicago: You first published “The Night Bookmobile” as a short story in Zoetrope in 2004. How did you adapt it into a comic? Audrey Niffenegger: I looked at each bit of it to see what should become pictures and what should stay text. Comics can do so many things so economically. I was trying to use that in a way that was elegant and not clunky. TOC: Do any specific examples come to mind? Audrey Niffenegger: I ran around Chicago shooting photo [references] with friends of mine who played the characters. There were a lot of occasions where something they would do with their faces was so perfect and beautiful. The pictures contribute this emotional subtext that wasn’t in the original story. TOC: Did you have a Winnebago to work with as well? Audrey Niffenegger: I wish! No, all the exteriors of the Winnebago are me faking it up from photographs. The Chicago Public Library very kindly allowed us to spend an afternoon on one of their bookmobiles, photographing. But the pictures don’t look precisely like the CPL’s bookmobiles, which are child-friendly but not quite what I wanted. TOC: How did Lincoln Square become such an important part of the story? Audrey Niffenegger: The beginning is set on a corner where I used to have a studio in Ravenswood, because I was constantly thinking how beautiful that little industrial corridor is. The biggest mistake I made was setting something outside of Wrigley Field, because Wrigley Field is so tedious to draw. Oh, well. TOC: Had you done comics before this? Audrey Niffenegger: Ages ago, when I was in high school. And I’ve been teaching Scott McCloud’s book Understanding Comics for years. That’s like a laundry list of every crazy thing you can do with comics. The Night Bookmobile was an opportunity to put some of that to the test. TOC: I found the ending kind of shocking. When you published it in The Guardian, how did people respond? Audrey Niffenegger: I got no response whatsoever. [Laughs] Once in a while, I would go online to see if anyone was even noticing this thing existed, and as far as I could tell, they did not. I think a lot of people are surprised by the turn that things take, but to me, it seemed inevitable. The story is to some extent modeled on “The Door in the Wall” by H.G. Wells, which is about yearning for something you can’t have, which appears intermittently. TOC: What are you working on now? Audrey Niffenegger: I’m embarking on a third novel, which is called The Chinchilla Girl in Exile. It’s about a nine-year-old girl who has hypertrichosis, which means she sort of looks like a werewolf. It’s a coming-of-age story about her attempts to go to school and have a normal life, be a kid. It doesn’t work out very well. “The Night Bookmobile” opens at Printworks Friday 17.